The following products are exclusively manufactured at MAECO. Engineered and certified for the severe environment of the construction trades, this pallet is the perfect choice for transporting. 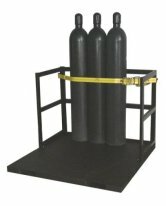 This heavy-duty movable cylinder pallet is designed to accommodate up to 16 high pressure cylinders or 4 liquid cylinders with ease. Features include a 1/4" floor plate, reinforced back rails, two 8" solid fork lift runners, and a 2" nylon ratchet strap rated at 5000 lbs. to meet OSHA spec. for transporting to and from the job site.